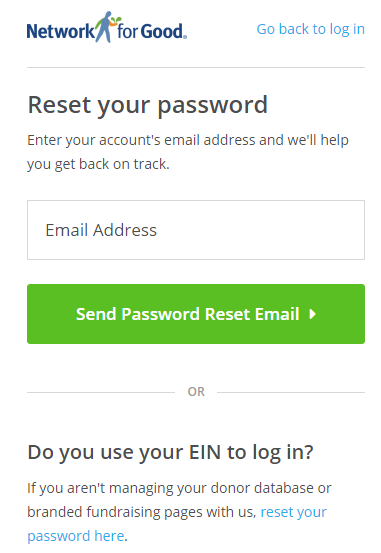 Do you typically log in with your EIN? Are you not sure? Check out this article first. Some organizations use both email and EIN. Only Network for Good users who pay a monthly or yearly subscription fee will use their email address. If this sounds like you, you have found the right article to get help with logging in today. Alright, let's get started, first, head over to the login page. On the next screen you'll enter the email address associated with your account, and click Send Password Reset Email. 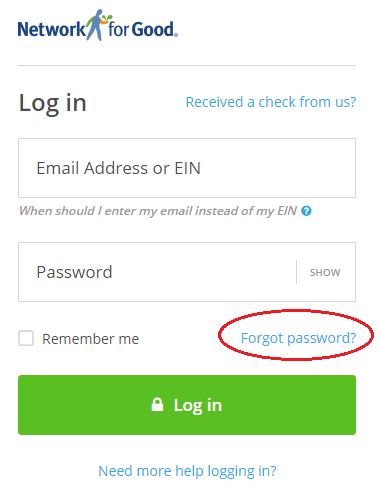 TIP: If you log in using your EIN, you'll click the link below instead of entering your email. Only Network for Good users with paid accounts will use their email address. Now check your email, click the password reset link, and set your new password. Log in, and get back to work. You're back on track! Help! I didn't receive an email! It's OK! Don't panic. Our password reset emails are automated, so can sometimes be caught up in your spam or junk folder. Check there to make sure that you didn't miss something. Instructions for whitelisting email senders will vary based on your email program. Check out this article for detailed instructions on how to whitelist from your particular email client. Then try sending that password reset email once more. If you still are not able to figure it out, send our support team a message. Why am I receiving money from Network for Good? Should I log in using my EIN? How do I register for a free DonateNow Lite account? How Do I Set up DonateNow Lite? Why are some of my donations anonymous? How do I find my Webinar? How does my organization get paid? Why can't donors make donations on my page? Don't see what you're looking for? No worries! Submit a request and we'll help you out! We received your request and our support team is working on it. We will get back to you shortly. Please check your inbox for a copy of the request. Happy Fundraising!